a dvd of kung fu panda 2 for blu-ray in dolby true hd. Po is my fav. As clumsy as he is, he still manages more unorthodox moves that take people by surprise. He gives them the Kung Fu Panda 2 DVD. Mr Ping. Great heart and belief in his son. The children received a DVD & Blue ray of Kung Fu Panda 2.
my fav. is Mr. Ping! James Hong shows the kids the Kung Fu Panda BlueRay. Please accept my entry. Thank you. the surprise is that Kung Fu Panda 2 is coming out in Blue Ray. Po is my fav ! My favorite character is Tigress, voiced by Angelina Jolie in the movies and Kari Wahlgren on the TV show. Mr. Hong has the Blu-Ray + DVD + Digital Copy in the envelope as the surprise for the kids. Kung fu Panda on blu-ray and with dolby sound. My favorite character is Monkey (Jackie Chan). Po is my favorite, Jack Black does a hilarious job with this character! The surprise is a Kung Fu Panda 2 dvd in blu-ray version. Thank you for hosting this giveaway. Tigress is my favorite Kung Fu Panda character. Mr. Hong offers up a blue ray with Dolby version of Kung Fu Panda 2 for the kiddies. Po is my favorite character. He makes me smile. The mighty Dragon Warrior, Po, voiced by Jack Black. He is my favorite character in both movies. Mr. Hong’s surprise is that Kung Fu Panda 2 is coming out on Blu-Ray. 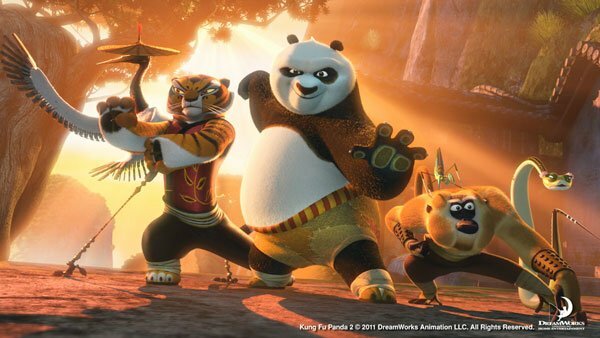 The surprise for the children is the new Kung Fu Panda 2 DVD on Blu-ray! Po is my favorite of course! Actually I have two favorite characters: Master Crane [for characteristics] and Master Monkey [because it’s Jackie Chan!]. my favorite character is Jack Black’s Kung Fu Panda himself!! A Kung Fu Panda Blu-Ray Video. Po, Would be my pick of the movie. He has the Kung Fu Panda 2 Blu-ray + DVD + Digital Copy! The surprise is the announcement of the Kung Fu Panda 2 movie on Blue Ray in Dolby True HD DVD. Po rocks- he’s my fave!! Gotta go with Monkey as my favorite character - I’m a big Jackie Chan fan, and he’s just as hilarious doing voice-over as he is in his live action films!